The Metro Manila shakedrill is a metro-wide synchronized drill for the preparation of the unexpected earthquake that might hit the country. 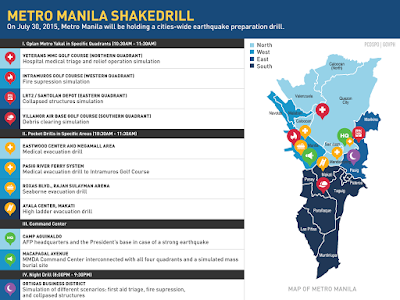 This morning at 10:30 a.m., Thursday, July 30, 2015, is the first ever metro-wide Shakedrill of the Philippines. According to Gazette Memorandum Circular 79, "all members of government departments, bureaus and offices are encouraged to participate in the drill," signed by Executive Secretary Paquito Ochoa. In addition to this, "The private sector, including volunteer and civic organizations, is also encouraged to participate in and assist with the drill." The Metropolitan Manila Development Authority is the government agency that will administered the metro-wide Earthquake Drill, with the cooperation from schools, business, government agencies, and religious organizations. Here's the infographic posted on Gov.ph, as a guide for the earthquake preparation drill. 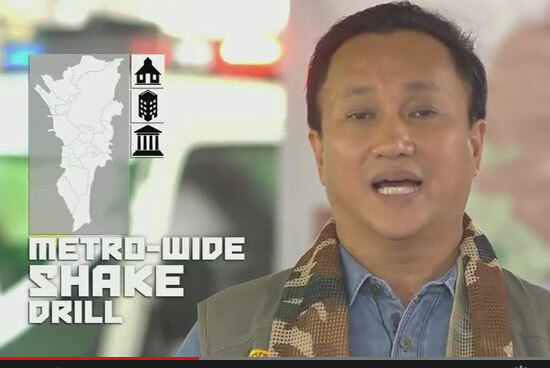 In this video description said, "Hinihikayat ng pamahalaan ang lahat na sumali sa kauna-unahang Earthquake Drill sa July 30, 2015, 10:30 ng umaga, na maghahanda sa ating lahat laban sa banta ng 7.2 magnitude earthquake." Comments or suggestions about "Metro-wide Shakedrill Philippines 2015" is important to us, you may share it by using the comment box below.